Cut the Cauliflower into thirds and place on a cookie sheet lined with parchment paper. Brush the Cauliflower with California Extra Virgin Olive Oil. Roast the Cauliflower for about 30 minutes or until brown then place aside. 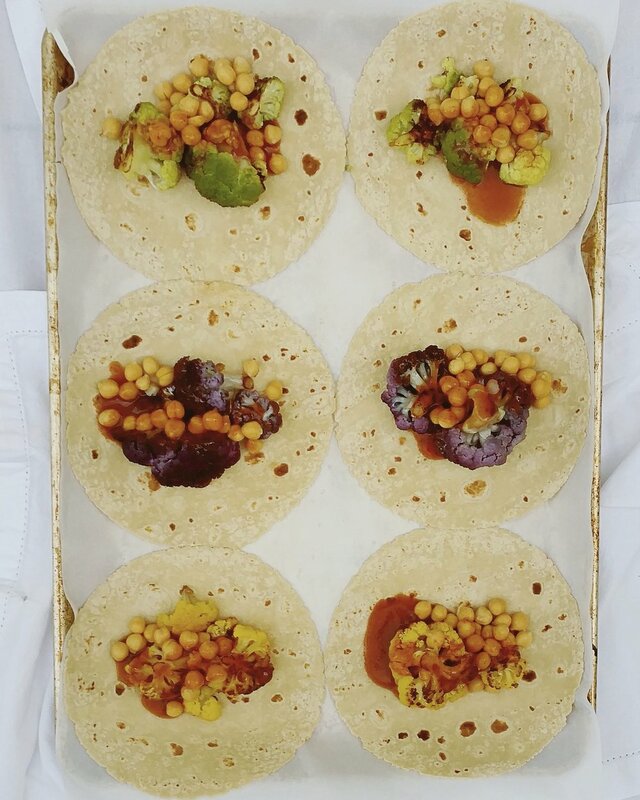 Place your Corn Tortillas on a parchment lined cookie sheet along with some of the roasted Cauliflower, Garbanzo Beans and Enchilada Sauce. Roast in the oven for about 20 to 30 minutes or until the Enchilada Sauce begins to bubble. Chop fresh Onion and Jalapeño and squeeze a fresh Lemon over it. Add some chopped Tomatoes and Pinches of Cilantro leaves for garnish. Too much smoothie can leave you feeling lethargic, play around with how big of a smoothie you need to feel satisfied rather than stuffed. Depending on what is in the kitchen, most days I make a smoothie but only half the size of the one pictured here. Open a Fresh Young Coconut and pour the water into your blender. Scoop out the Fresh Young Coconut Meat and add it to the blender. Add frozen Bananas and frozen Blueberries and blend until smooth. Add fresh slices of Kiwi to your smoothie glass then pour the smoothie in the glass, top with the Dehydrated Coconut and enjoy. To make a delicious sandwich start with buying the highest quality ingredients you can find. This baguette from Prager Brother's is delivered warm to the Carlsbad Ranch Market as well as their other pastries and pretzels. Along with fresh bread, the Carlsbad Ranch Market carries the best avocados around, lots of local produce and it’s located in the same building as my yoga studio, yoga80 Carlsbad making it convenient as well. Wash all the ingredients and let dry on a dish towel. Slice the Eggplant and set on a paper towel. Lightly salt each side of the Eggplant so it can sweat out some of the bitterness. Brush generously with California Extra Virgin Olive Oil and place the Eggplant on a cookie sheet lined with parchment paper. Cook in the oven for 15 to 20 minutes or until brown, turn the Eggplant halfway through. Thinly slice the Yellow Squash and set aside. Thinly slice the Heirloom Tomato and set aside. To assemble to Sandwich slice the baguette in half and place the roasted Eggplant straight from the oven hot on the baguette first, then right on the hot Eggplant add the thinly sliced raw yellow squash followed by the Heirloom Tomato, Basil and top with Avocado. You can enjoy the sandwich right away or wrap the baguette in parchement paper and take it to the beach. The sandwich will last 24 hours with the Avocado but you could leave the Avocado off and it will last longer 48 + hours. Then add Avocado to the sandwich right before you serve the meal. CYL Vegan Sushi Rolls without rice, tonight's is sautéed Mushrooms, Shredded Carrots, Steamed Asparagus, Cucumber with Avocado all wrapped in Seaweed. First sautee the mushrooms. Mix 2 Tablespoons of Soy Sauce and 1 Tablespoon of Pure Maple Syrup and set aside. In a frying pan sauté the sliced Mushrooms in 1 Tablespoon of California Extra Virgin Olive Oil on high heat until the Mushrooms sweat out all their liquid and begin to brown, this takes about 10 to 15 minutes, then right at the end add the Soy Sauce and Pure Maple Syrup and sauté until the mushrooms are coated well. Steam the Asparagus and set aside. Wash and slice the Cucumber and set aside. Grate three large carrots and set aside. To assemble to rolls place your sushi roller down first then a large Seaweed Wrap, add your Cucumber, Asparagus, Avocado and Mushrooms, roll tight and slice with a sharp knife, repeat until your full. Fresh green juice takes vary little time. No juicer, no problem. Blend all your ingredients in a high speed blender and squeeze out the juice with cheese cloth, you are left with a vitamin and mineral rich green juice. Roughly chop the ingredients to fit in your blended and fill the blender about three quarters of the way and add enough water to cover the blades of your blender. Blend on highspeed until everything is blended together well. You can add more water if needed. Carefully pour the ingredients into the cheesecloth, squeeze out the juice and enjoy. You can store the juice in the refregerator for 48 hours in a glass covered container. Homemade Pho, with homemade vegetable broth. For my consititution it's better for me to stay away from spicy foods but when I am sick I notice it helps me fight off whatever I've got. Tonight my Pho is extra spicy. Chop up Carrots, Cabbage and corn and add them to the large soup or serving bow. Slice thinly some Lime and Lemon wedges to garnish the soup and then juice the remainder and add to the bowls. Here I used an entire Meyer Lemon and Lime for each bowl. Peel and chop the fresh Ginger into very small pieces, add to each bowl. Deseed and slice the Jalapeno. Cook the Rice Noodles as instructed, add to the bowls. Cover each bowl with as much hot vegetable broth as desired, stir, slurp and enjoy. This broth can be the base to many meals and the convenience of having it on hand will make it easy to get dinner or lunch on the table. You can add it to sauces, make a quick Pho or drink it on its own for a boost of essential vitamins and minerals. Roughly chop the ingredients, add them to a large stock pot and cover with water. On high heat bring the pot to a boil then turn down to low and simmer for 4 hours. Strain the cooked veggies and what you are left with is a simple vegetable broth. You can freeze the vegetable broth, it will last 4 to 6 months. My May-grey, sunset walk inspired these big bowls of Coconut Soup. Living on the coast of San Diego we see a lot of grey in the early summer which is not what you'd think of San Diego weather. The clouds can catch people off guard but I love the cool nights. In a large sauce pan add two cans of Coconut Milk, a carton of Vegetable Broth, two fresh stocks of lemongrass cut in half and the Daikon Radish sliced in large circles and bring to a boil. Simmer on medium/high for about an hour stirring regularly. Stream the Baby Potatoes in a steamer for about 20 to 30 minutes or until cooked through. Prepare the bowls with freshly chopped Mushrooms, Bok Choy, Ginger and the steamed potatoes. Into making these Vegan Sushi Rolls for dinner, tonight's was sautéed Mushrooms, Asparagus, Cucumber, Avocado with Brown Rice wrapped in Seaweed. This recipe made three rolls. In a sauce pan cook 1 Cup of Brown Rice in 2 Cups of Water, with 1 Teaspoon of Rice Vinegar and 1 Tablespoon of Pure Maple Syrup, bring to a boil on high heat, then reduce the heat and cover to cook for 20 to 30 minutes or until the rice is cooked through and the excess water has evaporated. Mix 2 Tablespoons of Soy Sauce and 1 Tablespoon of Pure Maple Syrup and set aside. In a frying pan sauté the sliced Mushrooms in 1 Tablespoon of California Extra Virgin Olive Oil on high heat until the Mushrooms sweat out all their liquid and begin to brown, this takes about 10 to 15 minutes, then right at the end add the Soy Sauce and Pure Maple Syrup and sauté until the mushrooms are coated well. To assemble to rolls place your sushi roller down first then a large Seaweed Wrap, Spread evenly the rice, then add your Cucumber, Asparagus, Avocado and Mushrooms, roll tight and slice with a sharp knife, repeat until your full. Inspired by all the beet posts I've seen in my feed the past few weeks I was motivated to try my hand in homemade Beet filled Ravioli. Roasted Beets, Sprouted Cashews and Coconut Milk filling with an ode to my Grandma Lessie's Egg Noodle Recipe I learned as a child. Soak 1 cup of Raw Cashews in water for 4 to 8 hours. Place 3 Beets with their skin on in Tin Foil and roast in the oven at 425º for 25 minutes then take out and let cool. Once cooled peel the skin off and set aside. In a blender add cooled, peeled beets, the Cashews strained and one can of Organic Coconut Milk blend well. Make the ravioli dough by adding 2 cups of all purpose white flour on a workspace in a mound. Add one egg to the flour in the middle and use the half of the cracked egg shell of cold water to the mix and mix well. Add the second egg and water as before be sure to keep the space well floured. Then once the flour, egg and water have created a dough roll it out flat. Use a pasta cutter and slice the pasta in strips. Add the filling to the pasta and use your finger to dip it in water and then dabb the edges of the pasta. Place another strip of pasta on top and seal the raviolis well with your fingers. 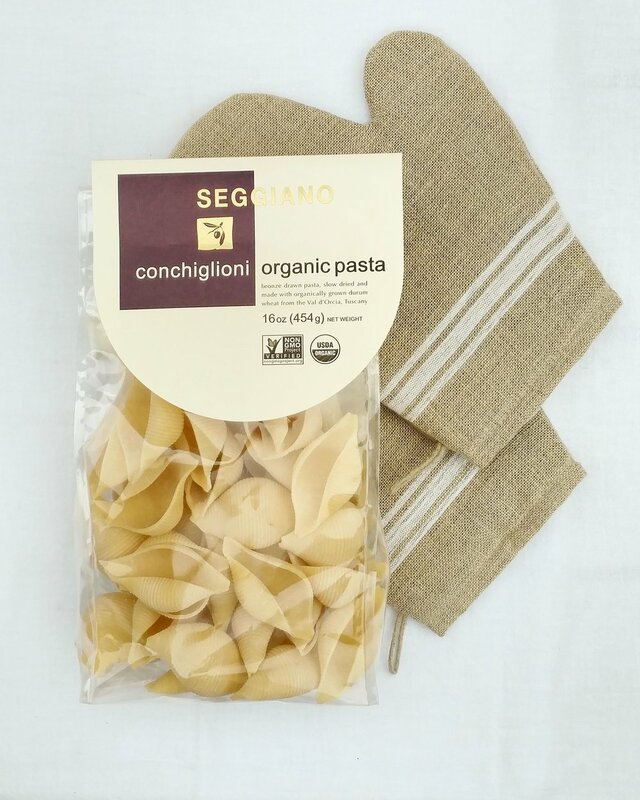 Boil a large pot of water and cook the pasta for 8 to 10 minutes or until al dente, serve with California Extra Virgin Olive Oil, basil, salt and freshly cracked black pepper. Stir-Fry is all about timing and the flick of the wrist. High heat, stir regularly, start with the harder veggies first, add the softer leafy vegetables towards the end. Offer Soy Sauce and Hot Chili Paste to garnish at the table and enjoy! Wash all your ingredients and let dry on a dish towel. Chop and set aside. Cook the Quinoa with a 1 to 2 ration. Here I used 1 Cup of tri-color Quinoa and covered it with 2 Cups of Water which is barely enough for two. Add 1 Teaspoon of California Extra Virgin Olive Oil and 1 Teaspoon of Apple Cider Vinegar bring the pot to a boil and then turned down the heat until the Quinoa is done which usually takes about 20 - 25 minutes. While the Quinoa is cooking, on a high heat add about 1 Tablespoon of California Extra Virgin Olive Oil to a frying pan along with the copped up Hearts of Celery and Carrots, stir frequently. 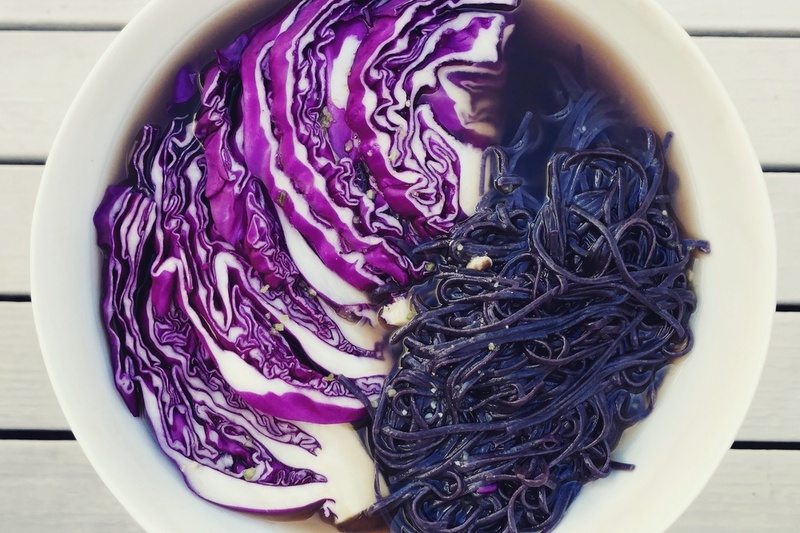 Once the Carrots and Hearts of Celery start to brown add the Purple Cabbage and right at the very end add the Sugar Snap Peas and Sesame Seeds. This all happens fast once the harder veggies brown so it is best to prepare all the ingredients before you start the pan. In order to make the most out of Turmeric it must be taken with a bit of fat and black pepper. Without fat, the active component in Turmeric, curcumin, has a difficult time being absorbed. Black Pepper has piperine which is a potent inhibitor of drug metabolism. One of the ways our liver gets rid of foreign substances is making them water soluble so they can be more easily excreted, piperine inhibits that process making it more easy to absorb. Bottom line, take Turmeric with a little fat and black pepper so you reap the incredible anti-inflammatory benefits. Open two Coconuts and pour the water it to your blender along with scrapping out any and all of the white meat. Peel an inch or two piece of Turmeric and Ginger and add them to the blender. You can add more or less to taste. If it is cold melt a Tablespoon of Extra Virgin Coconut Oil and add it to the mixer along with about 1/4 Teaspoon of freshly cracked Black Pepper and 1/2 cup of Sprouted Almonds. Blend well and enjoy. If you store it in the refrigerator the Coconut Oil could get hard. You can blend it again to melt it. 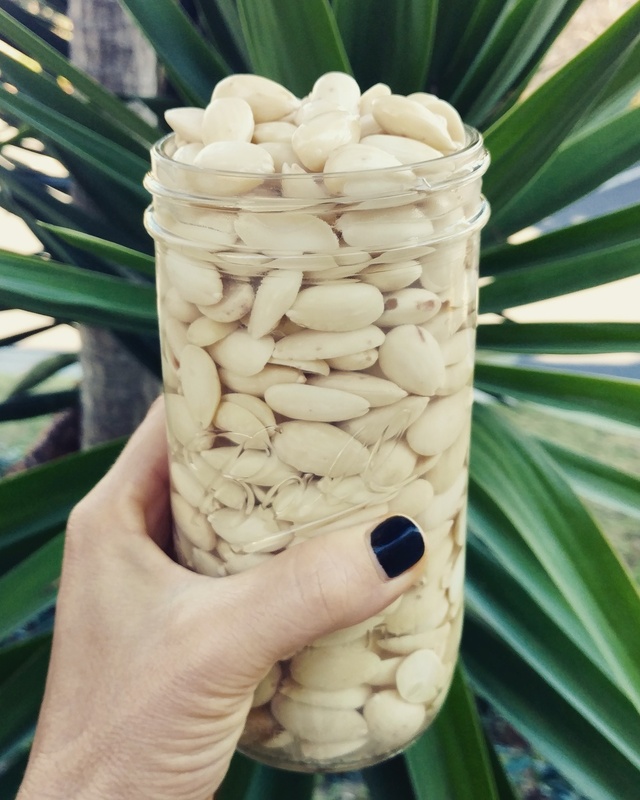 The Sprouted Almonds need to be started the day before. Soak the almonds over night 18-24 hours. Boil a big pot of water. Place the soaked almonds in the pot of boiling water for 15-20 SECONDS- just enough time so that you can peel them. Right away strain and place the almonds in an ice bath. Peel the skins off while you chant the mantra for purification. Store in the refrigerator in a glass container covering the almonds in water. They will last up to 2 weeks as long as you be sure to change the water daily. We are now selling Bhairava Tea at both our yoga80 studio locations. I drank tea from an acupuncturist in my twenties for two months with great results (small baggies with roots and bark etc, I had to boil down) but it was a lot of work so I really like how easy it is to make Bhairava Tea. Initially I signed up for the Bhairava Tea as a tester and my results were so great I knew as soon as they offered it to the public I wanted to share it with all of you. We are selling two formulas to start, the Strength and Flexibility Vegan "Bone" Broth along with their Flow and Flexibility blend. I personally use the Vegan "Bone" Broth once daily on it's own or sometime I make a meal out of it by adding noodles and veggies to the broth. I also have done the Flow and Flexibility blend as part of a two week cleanse with amazing results. On the Flow and Flexibility blend I found my senses heightened so I could better understand in my yoga practice places which either need more attention, more "contraction" of the muscles or even places which need to relax. I found the tea gave me new understanding of places I didn't even know about before which gave me a deeper introspection allowing me to better understand and come to peace with some personal things I have been dealing with and experience some emotional release as well as how to move forward. Into these Lemon, Ginger, Mint Elixirs I've been making, just add hot water. Hydration is a key component to health but staying hydrated is not always easy. One way to stay on top of your hydration is to find simple ways to add more liquids into your day, like this elixir, add fresh squeezed Lemon, Ginger and Mint to a large mason jar, cover with hot water and enjoy. Roasted veggies brushed with a little bit of California Extra Virgin Olive Oil are making dinner way too easy for me to get on the table these days. 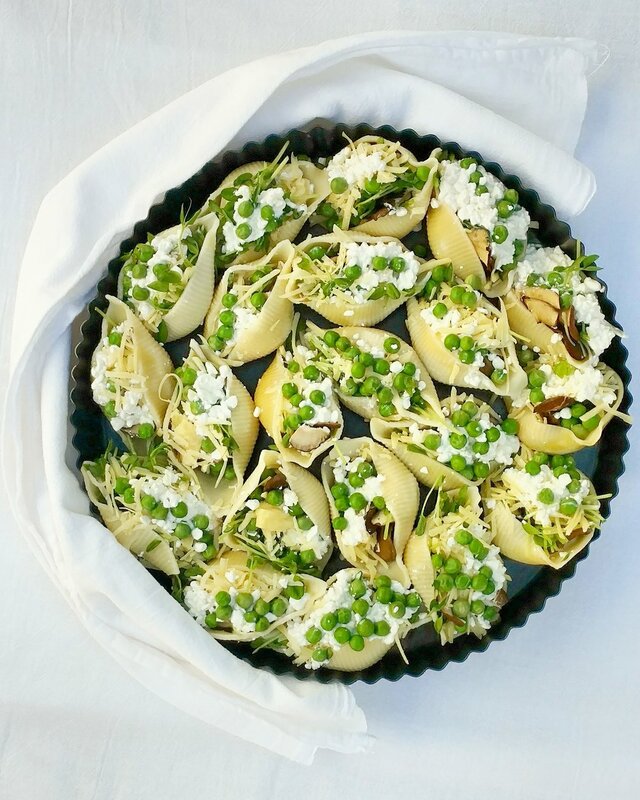 Move past the norm and try out unusual varieties for a more adventurous side dish or roast a bunch of different veggies and make it the main coarse. Wash the vegetables and let them dry on a dish towel. Use a large bowl and add a small amount of the veggies to the bowl and lightly drizzle them with the California extra Virgin Olive Oil. Use your hands to be sure they are coated well. Repeat until all the veggies and oiled. Place the lightly oiled veggies on a large cookie sheet lined with parchment paper. Cook for about 30 to 45 minutes. Be sure to check that they do not burn. When the veggies start to turn brown take them out of the oven to serve. Have you made one of my recipes? Let's see them, post a picture and tag #FallinLoveWithTakingCareofYourself - also there is a place to comment below with questions or comments. I'd love to know what you all want more of here at CYL - California Yoga Living. A "big" storm rolled through San Diego recently blowing over lots of trees. The wind also blew through many of our students citrus trees and we had numerous people bring us big bags of fruit. Made my Vegan Key Lime Pie thanks to our generous gifts. 1. Preheat oven to 350F. Oil a pie dish with coconut oil and set aside. 2. For the crust, stir chia seeds into the water and allow to soak for 10 minutes. In a food processor add sweetener, salt, arrowroot, and mix well. Add shredded coconut and spin until very fine. Stop it and clean the sides several times to be sure it grinds very fine. Add vanilla and soaked chia seeds to food processor and mix again until it becomes a soft, uniform dough. Place the dough a board between two pieces of parchment paper. Dust the surface with arrowroot powder to keep from sticking. Use a rolling pin to roll it to 13 – 14 inches round, depending upon the size of your pan. Remove the top layer of parchment paper, and use the bottom layer of paper to flip dough gently over onto pie pan. Repair any rips. Prick the bottom of the pie with a fork in a few places. Pre-bake crust for 20 minutes at 300 degrees. Cool the pie crust. 3. For the filling, place lime juice and agar agar flakes into a small sauce pan and warm on medium-low heat until the agar agar flakes dissolve into the juice. You’ll need to stir the mixture regularly and watch that it doesn’t come to a boil. Just leave it long enough on the heat for the agar agar flakes to dissolve. Remove from heat. 4. Place all remaining filling ingredients into a blender (or use a bowl and an immersion blender — that’s what I used) and process until smooth. Add in the key lime juice and agar agar mixture and blend a few seconds longer to mix it in. Pour this mixture into the baked pie crust. Place the pie pan into the freezer to set for at least 20 minutes. 5. Meanwhile, prepare the whipped topping. Open canned coconut milk and scoop out only the solid part of the milk into a medium sized mixing bowl. Add in vanilla and maple syrup and whip it up with a mixer until it’s light and fluffy. (Store remaining coconut water for later use or discard). 6. Warm up the water and the agar agar on medium heat in a small saucepan or pot. Keep whisking it until the agar is fully dissolved. Do not wait till the mixture boils! This is important, as it’ll clump up. Once the agar is just dissolved, pour the mixture into the whipped coconut cream and whip some more until everything is combined. 7. Scoop coconut cream mixture into the pie atop the key lime layer. Spread it around evenly. Place pie in the fridge and refrigerate for at least a few hours before serving to allow it to set (or place in the freezer for 1 hour to speed up the process). I found that the longer it was chilled, the better it tasted! Current obsession - T U R M E R I C ! In order to make the most out of Turmeric it must be taken with a bit of fat and black pepper. Without fat, the active component in Turmeric, curcumin, has a difficult time being absorbed. Black Pepper has piperine which is a potent inhibitor of drug metabolism. One of the ways our liver gets rid of foreign substances is making them water soluble so they can be more easily excreted, piperine inhibits that process making it more easy to absorb. Bottom line, take Turmeric with a little fat and black pepper so you reap the incredible anti-inflammatory benefits. This fresh juice recipe comes out like an "Orange Julius" and has all the fat and black pepper needed to absorb the amazing benefits of Turmeric. Juice 2 to 3 cups of fresh citrus and add it to your blender. Here I used Tangelos. This is a new spin on a old family recipe. Make the Tabbouleh Salad with out the tomatoes so it last longer in the refrigerator and add carrots for an extra crunch. Soak and prepare the Bulgar Wheat as recommended on the package. Here I used a fine cracked bulgar wheat and soaked it over night in the refrigerator and then strained it the next day for the salad. Wash all the ingredients and lay them flat on a dish towel to dry. Pinch off the Mint and Parsley (here I used one package of fresh mint and one bundle of parsley) either with your hands or scissors into a large mixing bowl. Chop the cucumbers and carrots and add them to the bowl. Add the strained Bulgar Wheat, juice of 3 to 5 Meyer lemons and about a 1/4 teaspoon of fresh cracked Sea Salt, mix and serve. Will keep for about 3 to 5 days in an air tight container in the refrigerator. Serve the Tabbouleh Salad with freshly chopped tomatoes and avocado or all on it's own, enjoy!